Austin festival Fun Fun Fun Fest begins this week, and of course that means tons of FFF Nites shows too. 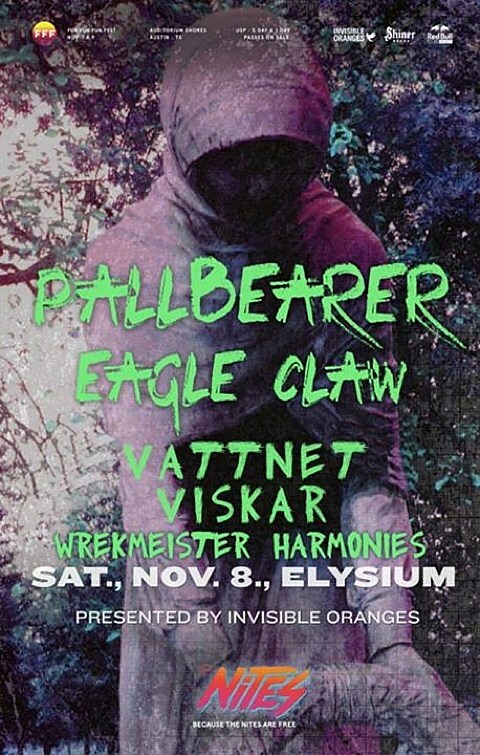 One of those is being presented by our metal blog Invisible Oranges on Saturday (11/8) at Elysium with doom greats Pallbearer, local rippers Eagle Claw, Pallbearer’s blackened tourmates Vattnet Viskar and JR Robinson’s metal collective Wrekmeister Harmonies. Like all FFF Nites shows, it’s free with a FFF wristband. Full fest and Nites schedules here.